The CBC reported recently on the Canadian Food Inspection Agency’s tests for pesticide residues on organic and conventional produce in Canadian grocery stores. The concern about pesticide residues is real: we should be wary of exposing ourselves to chronic low doses of complex and untested chemical mixtures. People are right to choose organic produce as a way to reduce exposure to these unknown risks. According to the report, CFIA testing between 2011 and 2013 found pesticide residues in both conventional and organic produce. Almost half the organic produce tested positive for at least trace amounts of pesticide. Based on this fact, the story implied that organics were practicing “false advertising”: people pay a premium for organic produce, but there are still pesticides in the food. This kind of story is perennial. The challenge for those of us in the organic industry is to respond to these reports by reminding the public about the good reasons to choose organic instead of conventional, while dispelling some of the misunderstandings about what organic food is. 2. Organic agriculture is simply farming without pesticides. Organic standards encompass much more than just a ban on synthetic pesticides. Organic farmers must use longer crop rotations that promote biodiversity, they must protect the soil from erosion, degradation, and sterilization, they must manage their livestock using higher welfare standards than conventional farmers. Organic farmers are allowed to use a select range of natural pesticides that are derived with minimal processing from minerals or plants. For example, insecticidal soap is an effective tool used for insect control by organic market gardeners. The list of permitted substances for organic agriculture is surprisingly detailed. It is published by the Canadian Government, and is enforced by third-party certifiers that audit every certified organic farm in Canada every year. Organic farmers that do not follow the rules face penalties or the loss of their certification. 3. Organics are not worth the extra money because we cannot trust the labelling. Organic crop yields are for the most part lower than their conventional counterparts. In addition, inputs like seed and organic-compliant sources of soil fertility can cost more than conventional seed and fertilizer, and organic farmers must pay the annual cost of certification itself. The premium paid for organic food compensates organic farmers for these economic disadvantages. The fact that some dishonest conventional farmers and food processors have taken advantage of the organic premium to squeeze some extra profit (like a bakery in B.C. selling conventional bread as organic) is not a strike against organic farmers. It is merely further evidence that the CFIA must adequately enforce the Canadian Organic Standard. There remain many solid reasons to choose organic instead of conventional produce. One reason was contained in the pesticide residue story itself: organic produce contains drastically lower amounts of pesticide than conventional produce. In the CFIA testing, while about half the organics tested positive, conventional produce tested positive almost 80% of the time. In addition, when pesticides were found on organic produce, the levels were lower on average than those on conventional produce. For example, average levels of thiabendazol (a fungicide) were 15 times higher on conventional apples compared to organic. Thus, eating an organic diet will reduce your exposure to agricultural chemicals. But there are other reasons to choose organic: the “carbon footprint” of organic farming is significantly lower than conventional, mostly due to the vast quantity of natural gas used in the production of nitrogen fertilizer for conventional farms. The diversified crop rotations used by organic farmers promote greater biodiversity of wildlife, birds, and beneficial insects. The fact that organic farms are not using synthetic pesticides means that organic farm labourers around the world are not being sprayed by pesticides directly. The improved richness of soil in organic agriculture means less erosion, better natural fertility, and a general improvement in the soil’s ability to recover from environmental stresses like dry or wet years. Organic agriculture is not only doing its part to slow climate change, but is also the form of agriculture best suited to adapt to climate change as it progresses. Clearly the demand for safe, nutritious food will continue to grow in coming years, and it is important for organic farmers to meet the challenge this demand presents. Eco Farm Day is an annual farm conference hosted by Canadian Organic Growers, Ottawa – St. Lawrence – Outaouais chapter in Cornwall, ON. This year’s conference is titled “Getting to the Roots” and our program is designed to promoting the kind of successful organic farming that will meet the growing demand for safe, healthy food produced in a way that protects the environment. 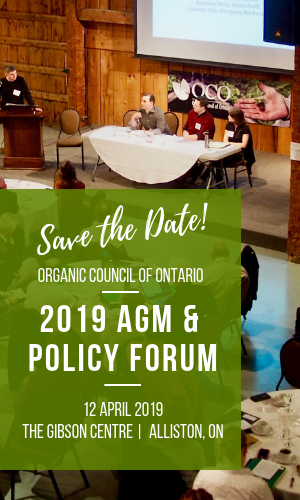 Speakers will include Matt Holmes of the Canadian Organic Trade Association on market outlooks and his response to the recent pesticide residue media coverage, Jodi Koberinski of the Organic Council of Ontario on the real health benefits of organic food, and Jean-Martin Fortier on bio-intensive organic gardening. For more information about this year’s conference, visit the Eco Farm Day website at www.ecofarmday.ca. About the author: Simon Neufeld is an organic agronomist with Homestead Organics in Berwick, ON, and Eco Farm Day 2014 conference chair. Eco Farm Day is an annual organic farming conference hosted by Canadian Organic Growers, Ottawa – St. Lawrence – Outaouais chapter.